I have been saying for years- Martinsville is my favorite track I have never been to. I LOVE to watch races at the crazy little paper-clip shaped track. The speeds maybe slower than a mile-and-a-half track BUT the racing action is much better. (Another reason I like Phoenix so much too- the racing action is awesome there). Sunday’s race was a prime example of why I love Martinsville. The quality of the racing is action packed and entertaining. And of course, I am going to say it was a great race because it was good awesome to see Tony up front and in contention for a solid top five (and even the lead) more than once during the race. The team even overcame at least one rough pit stop- but Tony stayed upbeat and told the team that he would get them back. And indeed he did- one right away as he kindly pointed out over the radio nearly just in case we didn’t see that. But Tony was actually driving like Tony Stewart in that he was competitive and able to – my favorite part of the whole race…was not the leading (okay I loved seeing him lead twice I really REALLY did) but was the pass to the outside Tony pulled on Joey Logano. I don’t remember the lap number or anything like that. THAT is Tony Stewart right there- passing where other people generally aren’t passing. Whoo! Tony qualified 4th- he finished 4th- but it was a great race- and he is now actually 25 in the points. 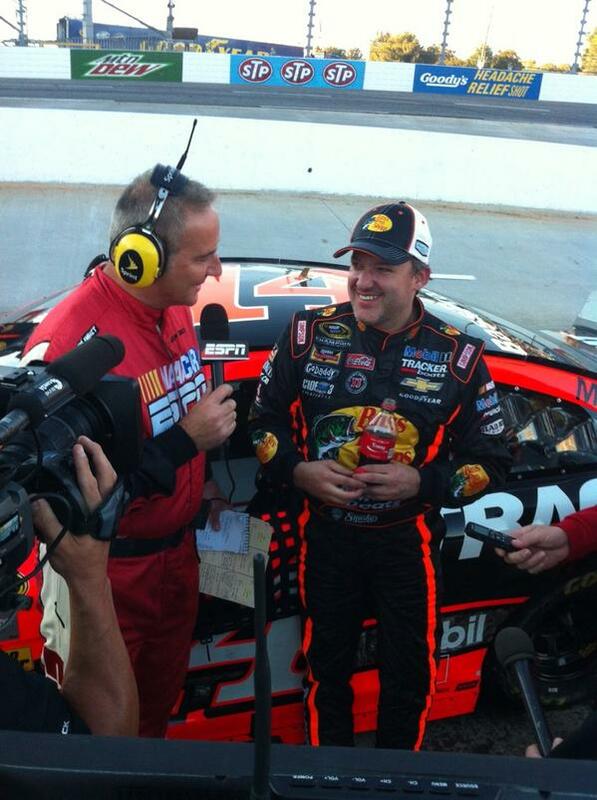 AND- Tony won not one but TWO contingency awards for the race at Martinsville! He won the Freescale Wide Open award AND the Mobil 1 Driver of the Race! Whoohoo Tony! That’s my driver!! The race winner was Dale Jr- who got his first grandfather clock. The highest placing chase driver would be Jeff Gordon who finished the race in second- hot on Dale’s heels. It was a good race to have a HMS 1-2 finish. Stewart-Haas Racing’s Obi-Wan in the chase (get it- you’re our only hope) is Kevin Harvick- who finished Martinsville an unfortunate 33rd after getting involved in a spin during the race and suffering extensive car damage. This weekend we are racing at Texas…where everything is bigger. It was just so awesome to be at Martinsville this weekend, I was thrilled to be there to see Tony race like we know he can. He was getting it done. I was happy for Jr. as well to be getting his first Grandfather Clock. Of Course, I was rooting for Smoke all the way, thought it would be just what he needed to help the healing but he was happy to have finished fourth saying it felt like a win for him. WTG, Smoke! It is Rising.